The Cheese Truck – New Haven, CT (@caseusgrilled) – Food Truck Talk – Searching for the best foodtrucks! 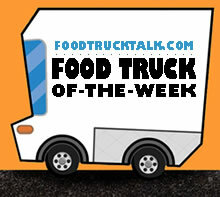 Congratulations to The Cheese Truck as FoodTruckTalk.com’s Food Truck Of-The-Week! At The Cheese Truck they say that every sandwich has a story! The Cheese Truck’s story is that it is an off-shoot of the well known New Haven, CT fromagerie (cheese shop) and bistro Caseus. The bistro serves an eclectic variety of gourmet foods that feature…. cheese! It was only natural that Caseus would expand their business and have their cheese products being served from a mobile eatery! Welcome The Cheese Truck. As you might imagine the lead item at New Haven’s Cheese Truck is the Classic Grilled Cheese Sandwich. Classic grilled cheese in my house meant Kraft American Cheese slices, not so at The Cheese Truck. Their version is a blend of provolone, swiss, comte, gruyere, gouda, and sharp cheddar on sourdough bread with orniehon pickels and grainy mustard on the side. As if that isn’t enough variety in one sandwich you can also add on any of the following: guacamole, grilled red onions, applewood bacon, jambon de paris, roasted red pepper, earugula, or tomato. We’re hoping that someone from The Cheese Truck will let us know what the most unique sandwich combination that they have created was! The Cheese Truck also offers a Sausage of The Day on a grilled bun as well as a variety of fresh salads including an arugala salad with pickled shallots, watermelon radish and Stilton blue cheese with a sherry vinaigrette or an orgranix local mixed greens salad with sharp feta, olives and cured lemon viaigrette. 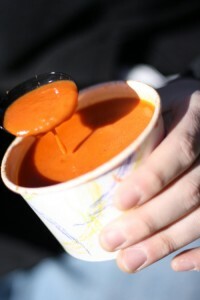 Of course, cups of Tomato Soup are also available. Grilled cheese without tomato soup is like peanut butter without jelly! 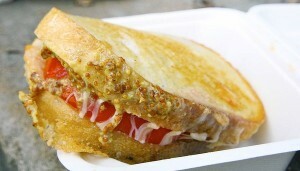 For easy ordering The Cheese Truck offers combinations of soup/sandwich, sandwich/salad etc. For a little bit of fun, The Cheese Truck challenges their customers to create a sandwich, order 10 of them, and eat them all in one hour without vomiting. If you succeed you get to name that sandwich, eat it for free, get a Cheese Truck shirt and your picture on a board next to the sandwich. Are you up to the challenge? 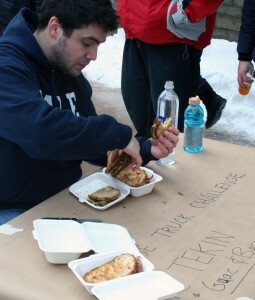 Etkin Tekin was up to the challenge, hence the “Tekin Sandwich.” A grilled cheese sandwich with bacon and guacamole. Etkin downed 10 sandwiches in just 32 minutes. We are not sure if the T-Shirt he won fit him after he completed the challenge! !